July’s column (and pictures, also mine) for First City magazine. Comments welcome. 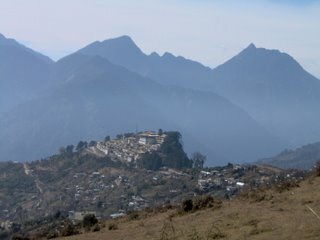 Say it with me; let the name roll gently of your tongue: Tawang. The moment I first heard that name, I knew I would go there one day. For Tawang is one of that collection of places – along with Zanzibar, Mandalay, Barbados, Mozambique – where so much of the exotic is conveyed in the sound of the name alone. Tawang is also not easy to get to; it requires more than fifteen bone-jarring hours of mountain driving from Tezpur on the Assam-Arunachal Pradesh border. But inaccessibility adds mystique, as every traveller will tell you, and the physical mystique of a hill-top settlement near the Indo-Tibet border surrounded by jagged snow-sprinkled peaks playing hide-and-seek with the clouds all add up to an irresistible allure. So it sounds good, but what does it mean? Once upon a time, the story goes, a monk called Merak Lama had a horse than frequently vanished on him, only to turn up in the same spot every time. The Lama took this as an auspicious sign, named the spot Tawang (Ta = horse, wang = blessing; ‘blessed by a horse’) and decided to build a monastery there. And what a monastery. Completed in 1580, and currently hosting over 320 monks, the Ganden Namghyal Lhatse Gompa is the largest monastery in India and apparently the second largest in all of Asia. It may also compete with Ladakh’s Lamuyuru Gompa for the nation’s most dramatically located monastery, especially when the setting sun paints it a striking orange in its valley cradle under the darkening spikes of the surrounding peaks. Given the gompa’s reputation as a major centre for Buddhist heritage and study, it can be incongruous to walk up the road leading to the prayer hall and come across friendly novitiate monks sunning themselves whilst playing Tetris on a Nintendo Gameboy. Walk further, into the Buddhist Studies building, and you can see classrooms of shaven-headed maroon-robed young monks-to-be receiving instruction in the tenets of Buddhism. And while these eight-year-olds may become sagacious monks one day, now they are like eight-year-old boys anywhere: pushing, pulling, teasing and tripping each other with grubby hands, runny noses and unabashed curiosity towards these strange Indians on their doorstep. For a monastery of this repute, its prayer hall is surprisingly small. The far end of the darkened rectangular room hosts the requisite large Buddha statue with a framed photograph of the Dalai Lama resting on an altar beneath it. Stretching out from the statue to the mural covered entrance are rows of simple cotton mattresses for prayer or meditation. The accompanying museum has an impressive collection of gilded Boddhisattva statues, massive elephant tusks, and jewellery and other artefacts belonging to the family of Tawang’s most famous son: Tsangyang Gyatso, the sixth Dalai Lama, born in the suburb (if you can call it that) of Urguelling in1683. 1. Try to stay up until 10 p.m.
2. Eat chowmein and Kit Kat for every meal. Being so close to such a sensitive international border – Tawang was one of the points through which the Chinese army invaded in 1962 – the Indian Army is ubiquitous here. 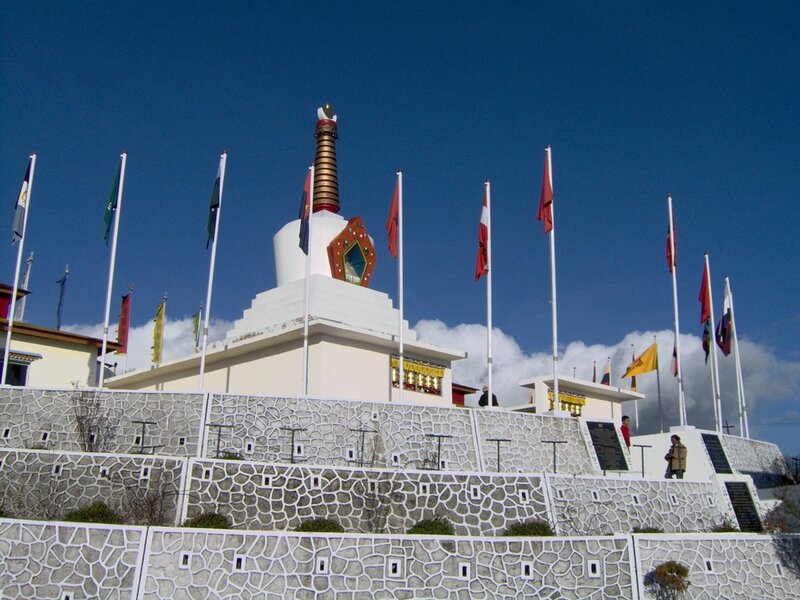 Apart from the bored soldiers who are always insatiably curious about casual visitors, the stand-out testament to the military importance of Tawang is its War Memorial, unusual, as far as war memorials go, in that it is a stupa, complete with Buddhist murals and prayer wheels. 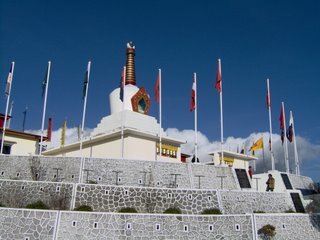 From the ground below, only the twenty-five fluttering flags around the stupa – one for each of the regiments that fought in Tawang – distinguishes it from other stupas. You have to climb all the way up to the memorial to see that it commemorates the 2420 soldiers that fell before the Chinese forces in 1962. The centrepiece of the monument is the bust of Subedar Joginder Singh who is supposed to have held off two waves of Chinese soldiers on November 23rd before gallantly charging them with his bayonet once he saw that all hope was lost. The Monpas of Tawang appear to have made peace with the ceaseless presence of soldiers and guns but every now and then a slogan painted on the wall of someone’s house indicates more complex emotions flowing beneath Tawang’s placid surface. My personal favourite, spray painted in black capital letters across the front side of a cottage, was this one: EDUCATION IS A BETTER SAFEGUARD OF LIBERTY THAN A STANDING ARMY. 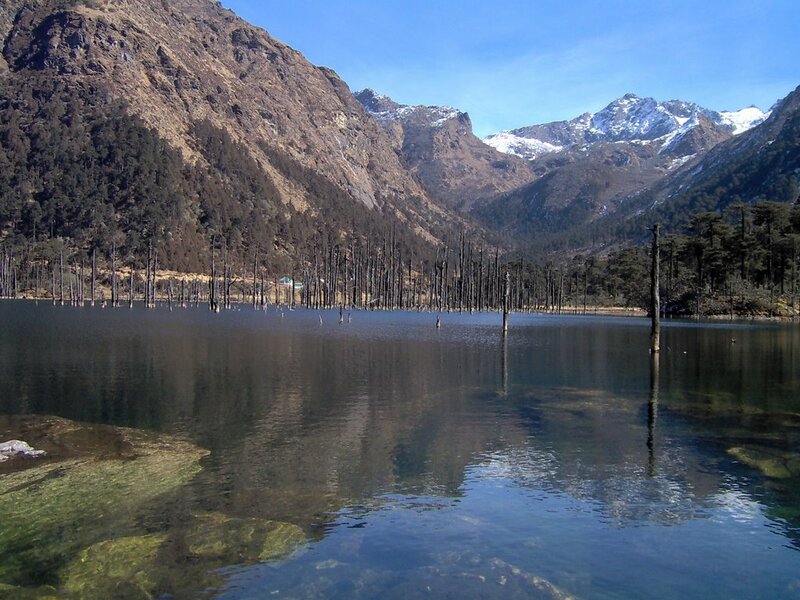 The region of Tawang is also justifiably famous for the 108 high altitude lakes that nestle in its hills and valleys. Driving through the stunning countryside to visit some of these lakes is one of the highlights of any trip to Northeast India. Apart from the lakes, one of the most interesting (though easy to miss) spots is a pair of shrines on either side of the road by Grepthang Tso (Tso means ‘lake’ in Tibetan). One shrine contains a black Trishul resting serenely against an icy Shivaling in a tiny room with open windows overlooking a beautiful valley and, in the other, a creaky wooden door swings open to reveal a gorgeous fresco of Guru Nanak painted with ochre onto a large rock. Both shrines have an air of timelessness about them. Further down the road, a forlorn word has been painted onto several large rocks: Jassi; whether by an ardent fan of the soap opera or a pining soldier for a lover is anybody’s guess. But it’s the lakes that you come here for, so that’s where we shall now go. The Pankang Teng Lake (known as PT Tso) is a fabulous introduction to the lake country but the highlight of the region, past PT Tso and Grepthang Tso and through the imposing archway of the “Ball of Fire Parvat Ghatak Academy” (at over 4000 feet, the highest artillery range in the country), is Sangetsar Tso. Popularly known as Madhuri Lake, after the filmstar Madhuri Dixit who pranced along its banks during the movie Koyla, the glacier-fed lake is slightly odd in that it contains a large number of bare tree stumps in the middle, remnants of a forest that was strangled to death when a change in the course of the glacial run-off created the lake. 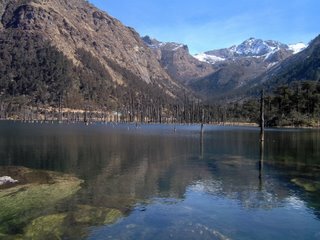 Although the stumps give the lake a somewhat decapitated look, they also add character to the astonishingly beautiful but also pretty much indescribable grandeur of this and all the other lakes of Tawang.